Today on fairly short notice We had to head out to the Riverland. As I have driven past Brookfield CP several times but never stopped to activate it, I made the decision to stop for a couple of hours and Activate a new one for me. We drove into the CP and followed the tracks around to the Picnic area and found a suitable place to set up. We were running a bit later than I wanted to be there, and arrived and got on the air just after 06:30UTC – I was hoping to be there around 05:30 to work LP EU. I have been working on some New Antenna’s – yes plural – for 20M and thought that this was the perfect opportunity to try them out. So, I set up, had a listen and the bands were quite busy, found a clear frequency, sent a spot and was pretty busy for the next hour! It was so hectic that it was about 45 minutes before I had time to pause for a photo of the set-up today! The Antenna system that I used today is a pair of phased 1/4 wave verticals with elevated ground plane. 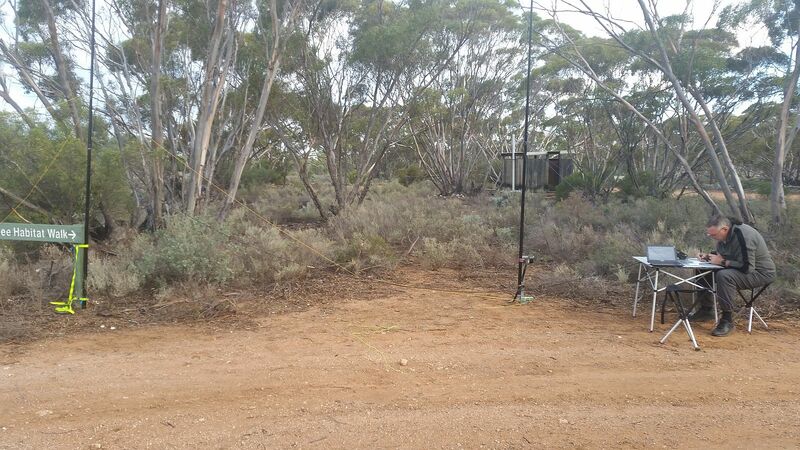 Using 2x 7M squid poles, the feedpoint is at the 2M high mark, and the 4 ground radials on each antenna slope back and are tied off to convenient places at ground level. Each Antenna is spaced at 1/4 wavelength apart and theoretically I should have about 3.5db gain and around 10db F/B and a nice low take-off angle of somewhere around 17 deg. Given the requirement for precise spacing, I used a convenient sign next to the track to mount 1 Antenna to then measured out the required distance and direction and used a post I carry with me to support the 2nd pole. 1 represents each Vertical Antenna, physically spaced 5M apart (1/4 wavelength). The ___50____ is 1/4 Wavelength (electrical) of 50 Ohm feedline, smilar is the __75___ for the electrical 1/4 wavelength 75 Ohm coax phasing line, The “T” is the Feedpoint, where I can run a 50 Ohm Coax to the operating position or simply plug in directly to the Transceiver. When Tuning the Antenna’s, Individually they tuned up very well – with a 1.3:1 VSWR across the whole band. I took my time making sure that they were both exactly the same before connecting them together. Once joined together, the Antenna Array came in at 1.4:1 across the 20M band, and of curse tuned no problem at all with the KX3. I realize that given the need for 2 poles and to actually get them into the ground at the right places that I may not be able to use this antenna set-up on every activation, but yeah, when I can, I’ll give it a go. Up until now I have only been using a dipole as an Inverted V on 20M at about 8M high when I go portable – and while it has been OK, the signals today were really good! Yes, It might have been conditions, but I think that the much lower radiation angle might have played an important part of the success. It was hardly any more trouble to get on the air than a single dipole, it was all up in under 10 minutes. Back to the Activation! From 06:41UTC until 07:28UTC I logged 35 contacts on 20M with only 2 of them from VK! They were mostly EU and just 1 from the US. According to my logs, Today was a brilliant success as I added 5 new Countries to my logs for portable operations as well – so pretty pleased. 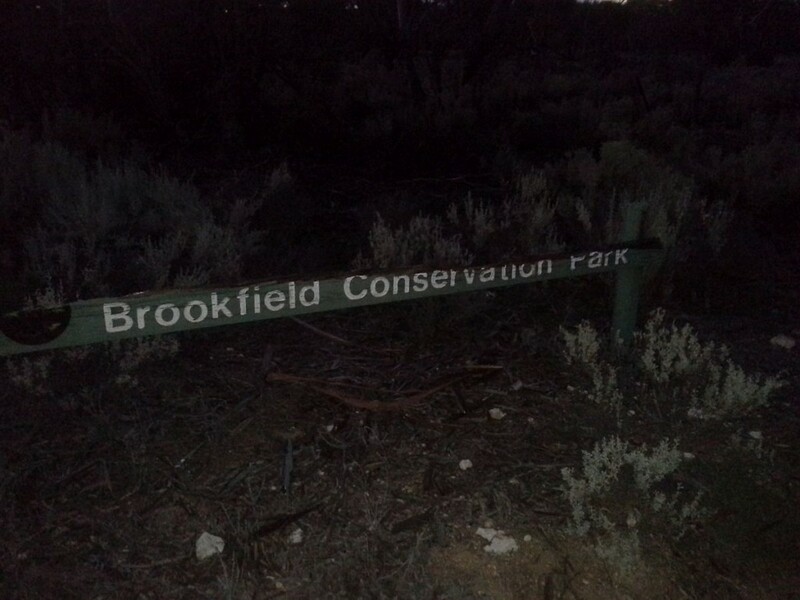 As we needed to exit Brookfield CP by sun-down, and 20M was slowing down, I quickly rolled out the EFHW for 40M and threw it up about 3M high between a couple of trees and posted a spot, and in the next 20 minutes or so worked the 9 required stations to log 44 contacts. Knowing that a lot of regular hunters are in Canberra for the WIA Event this weekend, I was glad to be able to rustle up the last few needed contacts! All things considered, with short notice, using a brand new antenna set-up, being about 90 minutes late, this was a great activation and I was really happy with how this antenna array performed. Now, I just need to do it all again to prove it was not just good conditions today! It was nearly dark when leaving the park and I grabbed a quick photo of the Sign (that is in need of repair) as we left the park. Great to get you in my logs this afternoon Danny!